Teaching and education has been in decline for ages. Combined with parents unable to raise their children to cope with the world - you end up right where we are. Government trying (incompetently) to filter voices. I thought it was parents who protected children, stupid me. Also saying you want the UK to be the best place to start and grow a digital business seems a bit of a contradiction when you're putting up barriers to entry. Another step towards making companies responsible for problems they didn't create (alone). When will our politicians finally give up their stupid game of hiding instead of facing the music and bringing change where it matters? Our education is a farce, teachers are either useless or completely in over their heads, kids are left to themselves (and their smart devices) by parents who either don't care or manage to do any proper parenting, and the state and media in unison cry about the sinister modern digital world being the reason for all of our problems. This is getting ridiculous by now. Based on what? As a teacher all I've seen over the past decade+ is a massive push and increase of standards relating to education especially in regards to teaching about the use of social media. How does it feel to be the one in a million? Honestly, I've not heard anything like your statement about the standard of teaching from anybody in the last decade or more. This isn't going to end well. Imagine if I compared someone to a horse. Based overall on the average capabilities of those finishing education - be it university or secondary school. Employers are hardly jumping at the chance to hire them (apart from the top end of course). I've been doing interviews for almost 15 years, the decline is enormous to the degree we're developing our own post secondary school 6 month course on how to be effective and why it matters. We'd not be spending huge resources if the quality was higher - especially when there were plenty in the past that didn't require this. Perhaps standards of individual teachers have increased, but the material and the outcome is woeful. Discussing this in an IT forum is possibly not for the best. It will just lead to off topic posts on my part at the least ^^. 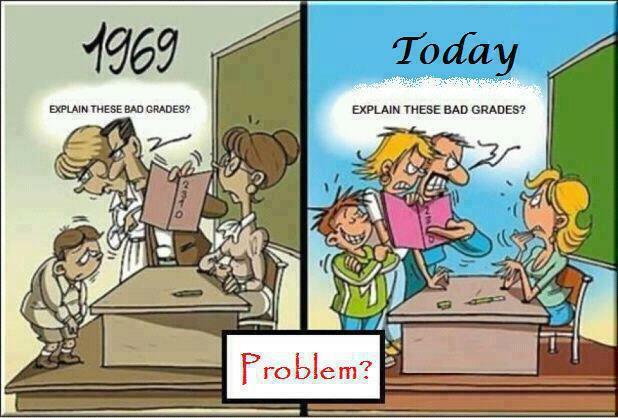 Don't worry mate, us teachers are used to being blamed for most of the modern day ills!